Baja Weather 2.0 - next generation. We serve you the latest Baja Weather forecasts since 2007 under the domain name "www.baja-weather.com" and before that another 3 years as sub-domain at a Cabo San Lucas website. It was time for a change. The optical differences on our new system are not to much, the website is now adjusted for usage with current smart-phones. We transferred most of the post and reports of the last 5 years over to the new system here. Feel free to approach us with any critique or suggestions to improve Baja Weather. Blanca Rapid strengthening is forecast. 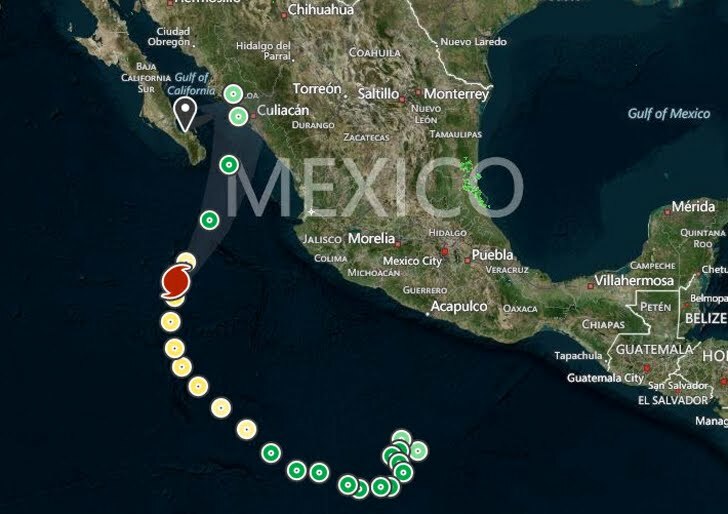 At 04:00hr CDT (0900 UTC), the center of Tropical Storm Blanca was located near latitude 13.3 North, longitude 104.6 West, about 585km/365 mi SW of Zihuatanejo and about 635km/395mi S of Manzanillo Mexico Blanca is moving toward the west near 1 mph (2 km/h). A slow and erratic motion is expected during the next couple of days. The tropical storm Blanca appears to be poised to intensify as a favorable environment characterized by low shear, warm water, and a moist atmosphere is expected during the next few days. The ASCAT data suggest that Blanca has drifted westward overnight, however, little overall motion is forecast during the next couple of days while the cyclone remains in an area of weak steering flow. After 48 hours, a mid-level ridge is forecast to strengthen and shift eastward over northern Mexico. 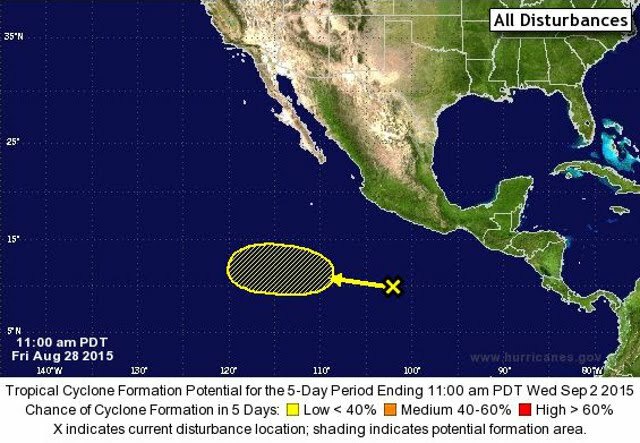 This should cause Blanca to move northwestward at a faster forward speed beginning Thursday. Maximum sustained winds are near 50 mph (85 km/h) with higher gusts. Rapid strengthening is forecast during the next couple of days, and Blanca is forecast to become a major hurricane by Wednesday night or early Thursday. 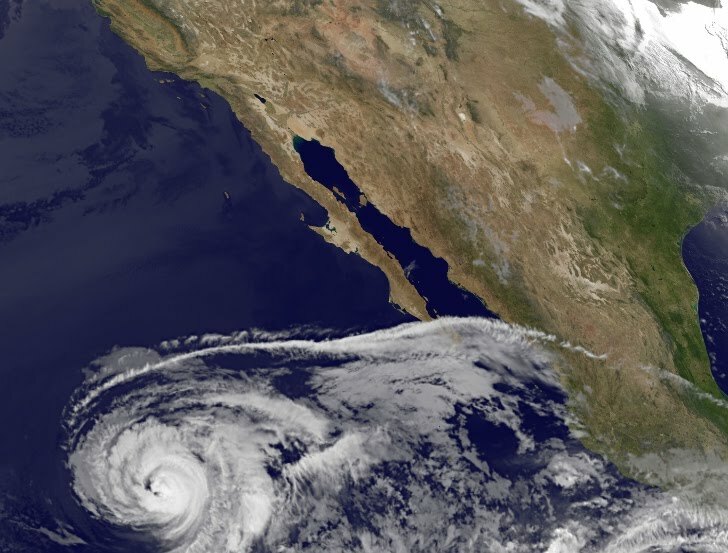 At 200 AM PDT (0900 UTC), the center of Hurricane Andres was located near latitude 17.2 North, longitude 122.2 West. Andres is moving toward the northwest near 10 mph (17 km/h). This general motion is expected to continue today, followed by a turn toward the north and a decrease in forward speed on Wednesday. Maximum sustained winds have decreased to near 105 mph (165 km/h) with higher gusts. Continued weakening is forecast during the next 48 hours, and Andres is expected to become a tropical storm tonight or Wednesday. Vance still a strong category two hurricane. Tropical storm watch issued for portions of southwestern Mexico. At 19:00hr PST the center of Hurricane Vance was about 160 km 100 mi SSE of Socorro island and about 780 km - about 485 mi SW of Mazatlan Mexico with maximum sustained winds of 175 km/h. The present movement is NNE or 20 degrees at 20 km/h - 13 mph. Interests elsewhere along the southwestern coast of Mexico should monitor the progress of Vance. Vance doesn't have much time left to try to peak as a major (Category 3 or higher) hurricane. If it does, it would be the ninth major hurricane of 2014 in the Eastern Pacific (10 if one counts Genevieve), and would break the eastern Pacific seasonal record for Category 3 or stronger hurricanes. Given Vance's initially powerful winds, swells from Vance will churn up high surf and rip currents at Mexico's Pacific beaches, even as the storm itself loses steam before reaching land. As Vance or its remnants approach Meixco and move onshore and tangle, very heavy rainfall may result, mainly Thursday and Friday. Hurricane Vance is moving toward the northwest near 22 km/h - 14 mph and a turn toward the north is expected by tonight followed by a turn toward the north-northeast on Tuesday. Satellite images indicate that Vance is maintaining its intensity, with very cold-topped inner core convection. Maximum sustained winds remain near 165 km/h - 105 mph with higher gusts. Vance could strengthen a little more today but a weakening trend is expected to begin tonight with steady to rapid weakening forecast thereafter. Swells generated by Vance are expected to begin affecting portions of the coast Baja California Sur in a day or two. Another system, 96E, with disorganized showers and thunderstorms is located several hundred miles south of Acapulco, Mexico and associated with a broad area of low pressure. Environmental conditions are expected to be marginally conducive for some gradual development of this system during the next day or two while it moves west-northwestward or northwestward. Upper-level winds are forecast to become less favorable on Wednesday and development after that time is not likely. Formation chance through 5 days...low...20 percent. 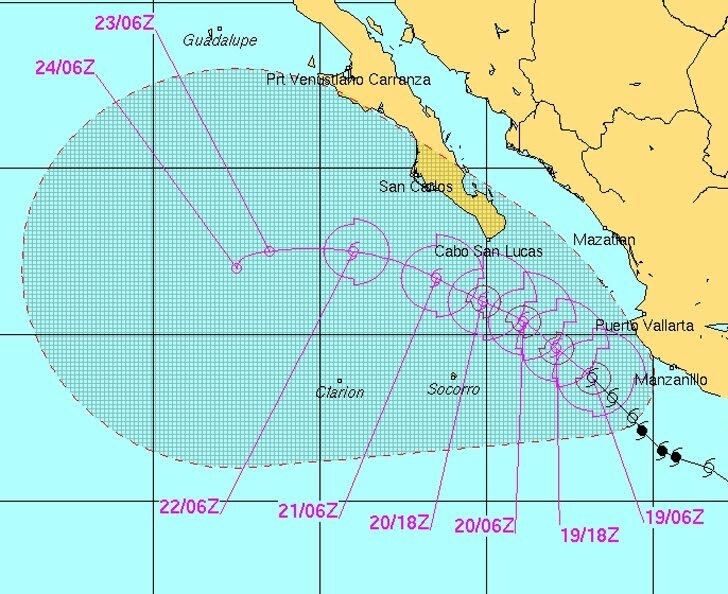 Polo to pass south of the Baja California peninsula on Saturday. 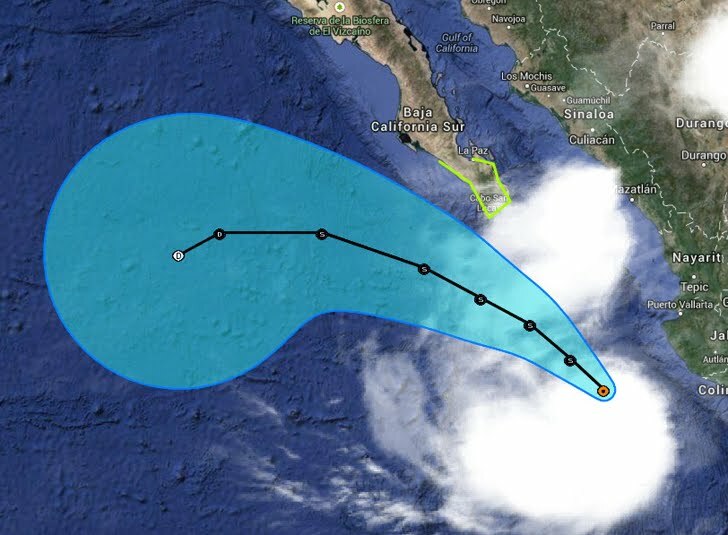 At 05:00 hr PDT the center of Tropical Storm Polo was about 470 km - 290 mi SSE of the southern tip of Baja California. Interests elsewhere in the southern Baja California peninsula should monitor the progress of Polo. A Tropical Storm Warning could be required for portions of the peninsula later today. Polo is moving toward the northwest near 13 km/h - 8 mph and this general motion with a decrease in forward speed is expected today. A turn toward the west-northwest is expected on Saturday. On the forecast track the center will continue to move parallel to the southwestern coast of Mexico today and pass south of the Baja California peninsula on Saturday. However any deviation to the north of the track could bring stronger winds to southern Baja California. Tropical storm conditions are possible within the watch area in southern Baja California on Saturday. Tropical storm force winds extend outward up to 165 km - 105 miles from the center. Polo, the sixteenth named storm of a busy eastern Pacific hurricane season, formed Tuesday several hundred miles south-southeast of Acapulco, Mexico. It became the season's eleventh hurricane on Wednesday. Going forward, it remains uncertain how or if Polo will affect the Baja peninsula, which is still recovering from Hurricane Odile, the record-trying strongest hurricane to landfall in Baja California. The current thinking is that building high pressure aloft over northern Mexico may help turn Polo toward the west-northwest, away from the southern Baja peninsula. Tropical storm conditions are possible in southern Baja California late Saturday and into Sunday. Keep in mind, however, that the average forecast track error for eastern Pacific tropical cyclones 4 to 5 days in advance ranged from 144 to 191 miles in 2013. 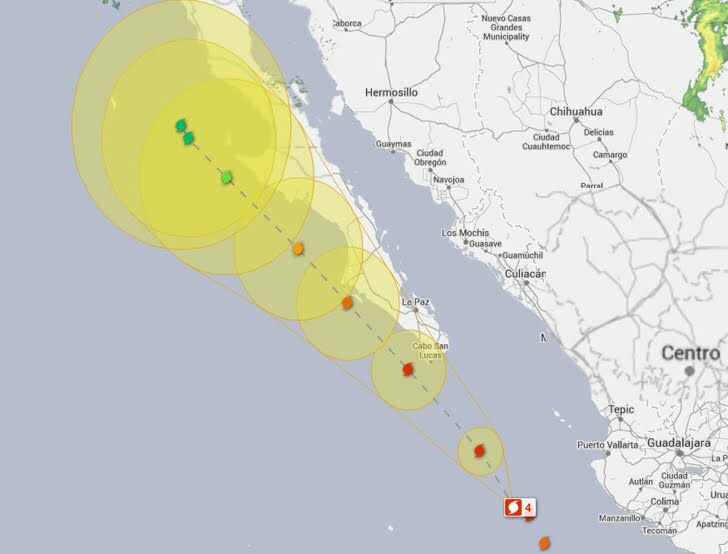 At 05:00 hr PDT the center of Hurricane Polo was located about 820 km - 510 mi SE of the southern tip of Baja California. Polo is moving toward the west-northwest near 13 km/h - 8 mph. A turn toward the northwest is expected later today with a northwestward motion continuing through Saturday. On the forecast track Polo will move parallel to the southwestern coast of Mexico. However any deviation to the north of the track could bring stronger winds to the coast. 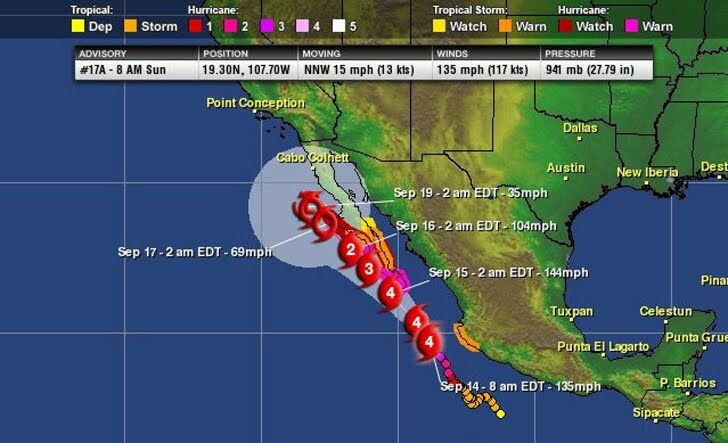 The storm is close enough to the coast that a Tropical Storm Warning has been issued for the coast of southwest Mexico. Maximum sustained winds remain near 120 km/h - 75 mph with higher gusts. Some strengthening is possible today and tonight. After that Polo is expected to weaken due to unfavourable upper-level winds. An Air Force reconnaissance plane is scheduled to investigate Polo later today. Residents and stranded visitors in Baja California should continue to keep an eye on Hurricane Polo. The outer bands of Hurricane Polo are currently bringing rain to parts of the southwestern Mexican coast. Periods of strong winds, heavy rain, high surf and rip currents may eventually affect portions of the coast. 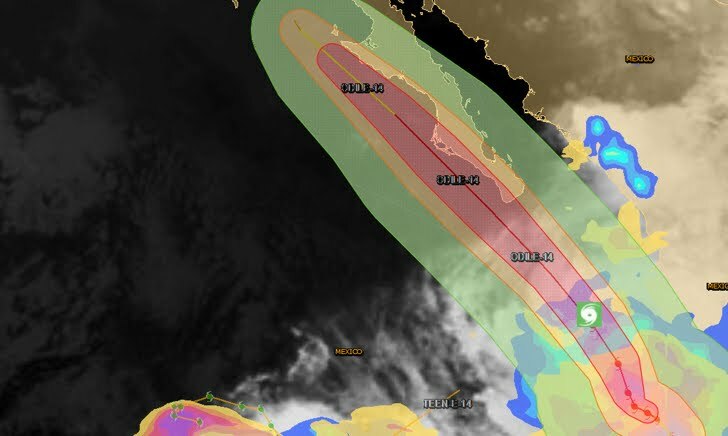 Rainfall amounts of 5-10 inches are expected with isolated totals of 15 inches possible near the coast of the Mexican states of Guerrero, Michoacan, Colima and Jalisco. The heavy rain brings the threat of flash flooding and mudslides. Hurricane Polo, the sixteenth named storm of a busy eastern Pacific hurricane season, formed Tuesday several hundred miles south-southeast of Acapulco, Mexico. 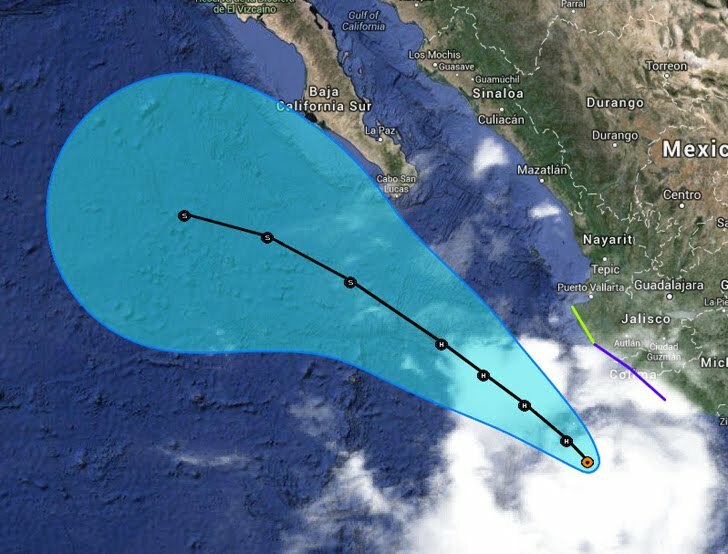 The Pacific coast of Mexico has a new hurricane threat to be concerned with - Tropical Storm Polo, which had intensified to 60 mph sustained winds 260 miles SSE of Manzanillo, Mexico at 11 am EDT Wednesday. The models have come into increasing agreement that the core of Polo will stay offshore, but the storm is close enough to the coast that a Tropical Storm Warning has been issued for the coast of Southwest Mexico. At 14:00hr PDT the center of Tropical Storm Polo was located about 295 km - 185 mi SSE of Manzanillo Mexico about 265 km - 165 mi WSW of Zihuatanejo Mexico maximum sustained winds 110 km/h - 70 mph. Polo is the sort of thing which can produce high anxiety, with a new storm forming and tracking not far from one which just brought disaster. The official forecast (which reflects the latest model guidance) is for the core to track solidly offshore of Cabo San Lucas. Then again, that was the case with Odile even with what was issued Saturday morning. At 14:00hr PDT the center of the eye of major Hurricane Odile was located by an Air Force Reserve reconnaissance aircraft about 225 km - 140 mi SSE of the southern tip of Baja California. 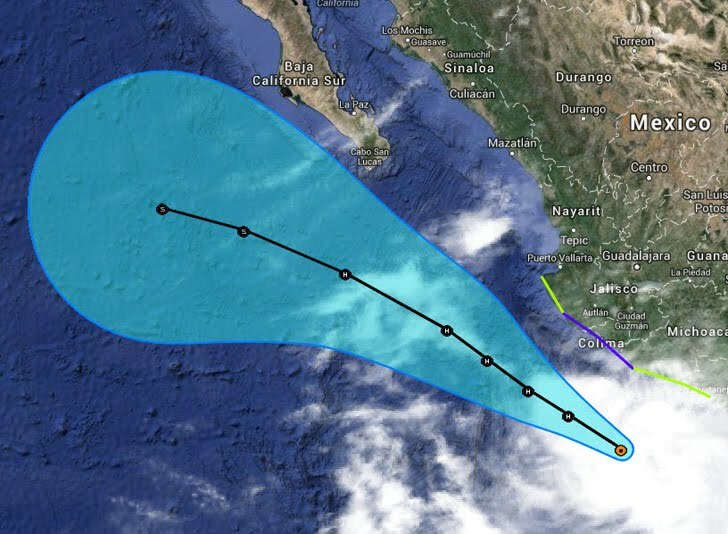 Odile is moving toward the north-northwest near 24 km/h - 15 mph and this general motion is expected during the next day or two. 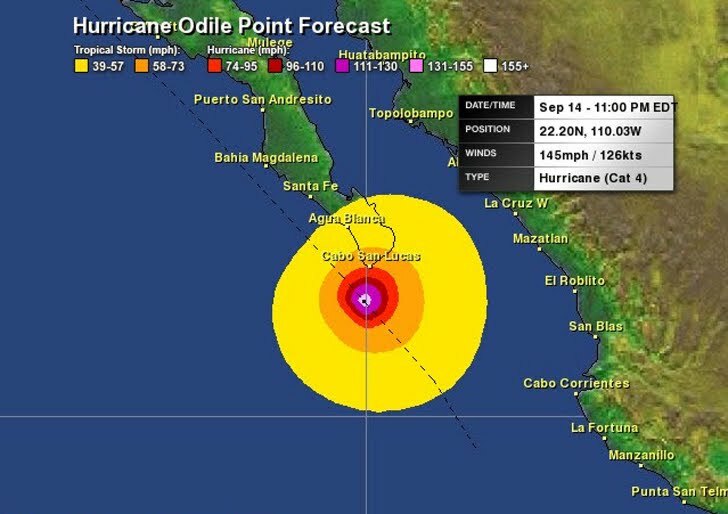 On the forecast track the core of Odile will pass near or over the southern portion of Baja California Sur tonight and Monday. Reports from the reconnaissance aircraft indicate that maximum sustained winds are near 205 km/h - 125 mph with higher gusts. 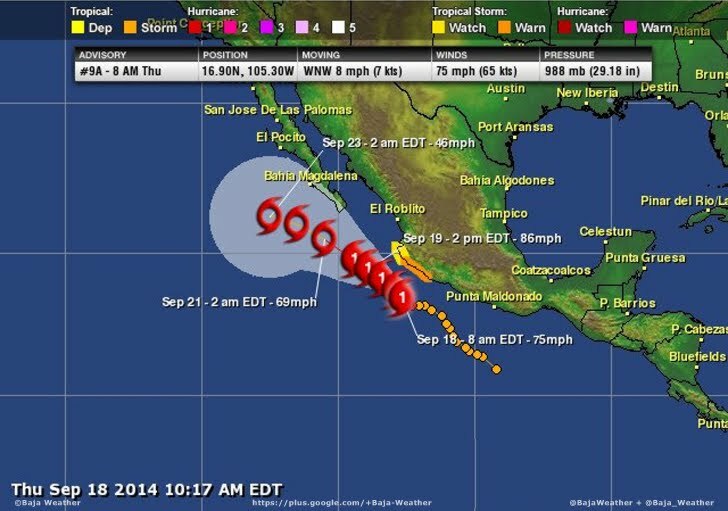 Odile is a strong category three hurricane on the Saffir-Simpson hurricane wind scale. 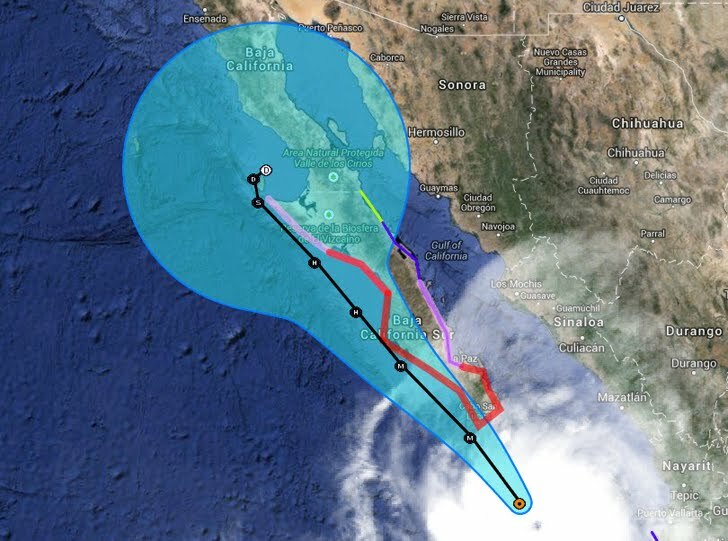 Some slight strengthening is possible overnight and Odile could become a category four hurricane again before it approaches southern Baja California sur. Gradual weakening is forecast to begin by Monday night and continue into Tuesday. 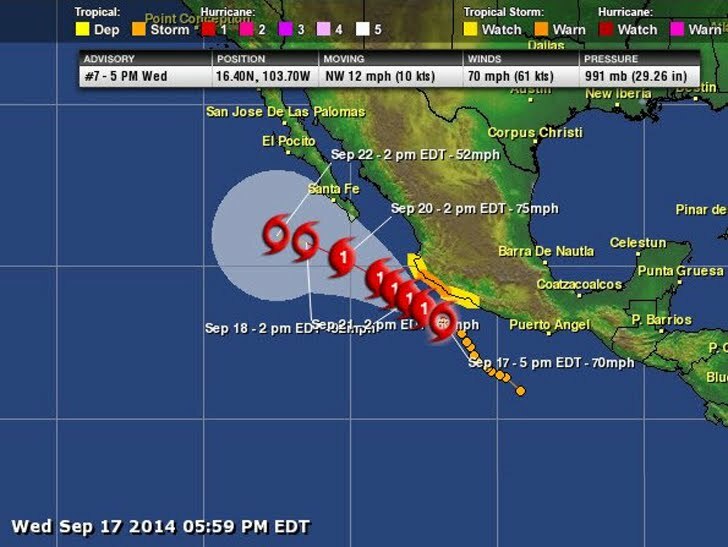 Odile is a large hurricane. Hurricane-force winds extend outward up to 85 km - 50 miles from the center and tropical-storm-force winds extend outward up to 295 km - 185 miles.